If you are like me, you cannot stomach McDonalds food product any more. I could handle it as a kid, but nowadays I rarely eat it, and never feel very good about it when I do. 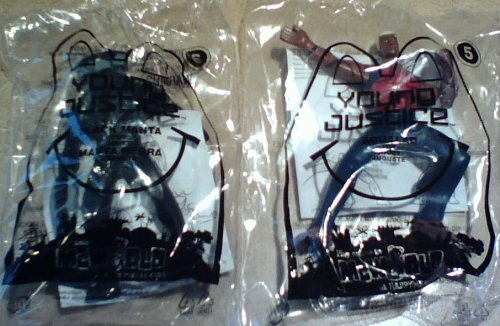 So when I heard they were doing a Young Justice Happy Meal promotion, I thought, "Great, I'm gonna have to eat mung again." However, I held out one shred of hope. In the past, I've managed to get the Wizard of Oz Happy Meal toys without too much effort. In fact, the last time they had them, hubby-Eric and I were able to get all the toys in one visit. Now I'm going to explain how we did it, so you can do it too if you want. 2) Call the store(s) you plan to visit and ask them if they have the line you are looking for. If you are looking for an individual figure, like I was, you still want to ask about the entire line. For instance, I called my store and asked if they had the superhero Happy Meal toys, then when she didn't understand, I asked about the Young Justice toys, and she confirmed they were in. 3) Make sure you go early in the promotion. Don't wait until the last week. If at all possible, go the first week the toys are out. 4) Go during a less busy time. The times vary depending on the store, but you are going to be taking up someone's valuable working time, so try to make sure you hit the store when it's not too busy. 5) Find or ask for a manager. The counter workers will usually not be able to help you with this request. 6) Ask specifically for the "Customer Satisfaction Box" for the line of toys you are looking for. There will be a box for each line, and most restaurants receive them sometime early in the promotion. Be polite, and if they have no idea what you are talking about, try to find another manager. You can also do this in step two, but you're going to have to ask in the store as well. A Customer Satisfaction Box is a box that simply contains complete sets of all the toys in a Happy Meal promotion. It usually has anywhere between two to six complete sets along with extras of the most popular toys. It is meant to be used to satisfy customer requests, but not all stores use it that way. The reason you need to go early in the promotion is because each store only gets ONE box per line of toys, and if someone gets there before you, they may all be gone. 7) This is important: some stores will let you go through the box yourself, others will not even let you see it. Make sure you tell them clearly which figures you want. 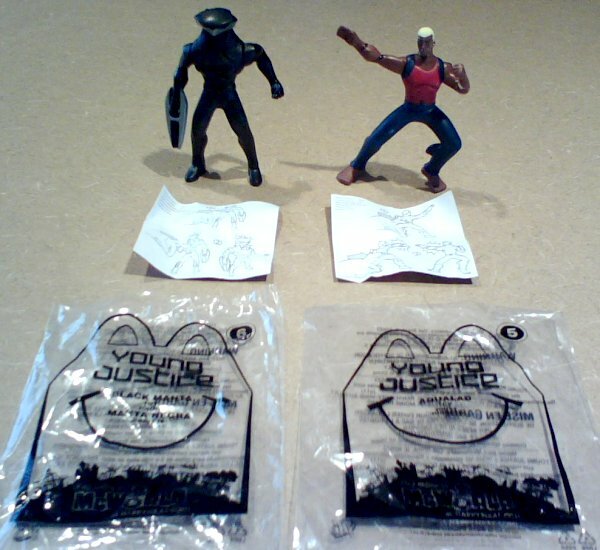 For instance, the Aqualad and Black Manta figures in the Young Justice set were figures 5 and 6, and both had the name on the wrapper, but it was hard to see. I also pointed them out on the display case to the assistant manager helping me. 8) Pay for your toys, and if they ask you to buy a meal, do so. Most stores will not require you to buy a meal to get the toys. 9) Be sure to thank everyone who helped you. This is also important. Don't be a snotty customer, give sincere thanks to the workers who just helped you out. Their duties do not require them to get that box for you, so you best be grateful if they do. 10) Go home and eat something healthy. This is an optional step. Ok, now I've told you what I did, and yes, I managed to get both Aqualad and Black Manta very easily and almost utterly painlessly. I got in a couple of people's way (sorry fellow customers!) and the poor fellow the assistant manager sent back to find the box had to search a little (it took him a few minutes), but for the most part it was no big deal. If I'd been thinking, I would have gotten two of each, but I barely had the cash to get one of each anyway. And I would LOVE to dissect these toys, as they are the first Happy Meal toys I've ever gotten that have an on/off switch because they light up. 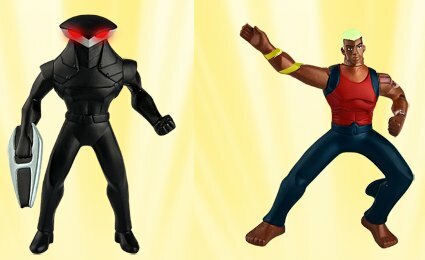 And while Aqualad's light-up arm tattoo is cool, Black Manta looks truly awe-inspiring with his light up eyes.